John Robert Fox was born in Cincinnati, Ohio on May 18th 1915, the eldest of three children from a family who lived in Woodlawn. Fox was attracted to military service as a student at Ohio State University where he wanted to enroll in ROTC (officer training), but because he was African-American he was not allowed to attend. He decided to forgo the credits he had accumulated at Ohio State and moved to Wilberforce University, currently one of three universities across the United States with a ROTC program. Fox graduated from Wilberforce in 1941 with a degree in engineering and a commission as a 2nd Lieutenant. In June of that year he was assigned to the 366th Infantry Regiment, and while in training at Ft. Devenes, MA. Fox was promoted to 1st Lt. and became a valued member of the so called "Cannon Company", an artillery unit in the 366th Infantry Regiment. The comrades of John Fox invariably called him an excellent officer. Some said "frank", while others said "bold." Everyone agreed that he was sociable. A veteran recounts, "Fox was a jovial, kind-hearted guy, always at the center of amusement." Arlene Fox, who knew him best of all, talked about his sense of humor, but stressed that he also had a very serious side. 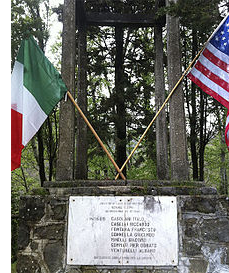 At the end of November 1944, the 366th Infantry Regiment was sent to help the 92nd 'Buffalo' Division at the western end of the Gothic Line extending throughout the Italian peninsula where the allies were halted trying to push the German forces to the north. Cannon Company joined the 598th Field Artillery battalion of the 92nd Lt. Fox battalion in the FDC (Fire Direct Control) where he quickly gained a grasp of mathematics to set up arms coordinates to match the indications provided by advanced observers. 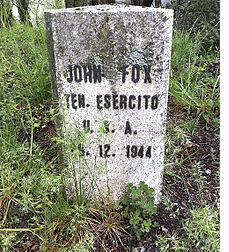 For the Christmas season of the same year, John Fox volunteered to be the advanced observer in Sommocolonia, a hilltop village in Barga, Italy at the northernmost point on the western Gothic Line, during which the Germans launched their assault as part of the Battle of Garfagnana. Fox had never done the job of advanced observer and had never been in the front line, but he was well trained to identify the exact position of enemy troops, enabling him to call for artillery regardless. He was so good during the battle that the present German shooters were instructed by their superiors to focus on hitting the advanced observer. Despite this, the American soldiers were greatly outnumbered by the Wehrmacht troops who soon managed to overrun the village with great strength. In a final desperate attempt to protect the country and curb the attack, John Fox sacrificed his life by calling for artillery on his own position in order to impede the surrounding German troops. Many enemy soldiers were killed by artillery fire and though the German forces briefly took Sommocolonia, the enemy assault was delayed due to the losses, giving the American 'Buffalo' troops in the nearby valley enough time to organize a counter-attack which was able to take back the area. Ultimately it was a sacrifice to defend the ideals of freedom and justice. The request for artillery by Lt. John Fox was honored in just a few minutes, but it took 52 years to be honored by his country with the recognition he deserved. In a ceremony at the White House on December 13th 1997, President Bill Clinton presented his widow Arlene Fox the posthumous Congressional Medal of Honor to John Fox, the country's highest military honor. Edited by Cpl. Svenson & PFC Laird. Great work, this was a very interesting one.